Take your Corvette, Pontiac G8 or Camaro SS to the limits with a crate LS3 GM performance engine. The LS3 does not claim 430 horsepower but it gives it. The high red line limit allows you to push acceleration to its peak without damaging the engine. Our LS3 crate engines are brand new and custom built by expert engine mechanics. True big-block power exists in these GM Generation family engines. Our GM Performance engines are sold way cheaper than what you will find when researching other engine dealers. We can sell cheap because we sell more engines and have an excellent reputation with buyers worldwide. Our warranty is often described by our customers as “excellent and “unexpected” after they make a purchase. If you have never bought a crate engine online, you should know that a warranty is something that is hard to come by unless all of your problems happen within 90 days to 6 months of your purchase. Very few warranties surpass this time frame leaving you with an engine problem that you have to take care of yourself. You can drive normally without tracking each and every mile to make sure you don’t exceed the limits. Just call us. We fix your problem fast. You don’t have to be concerned with our prices. 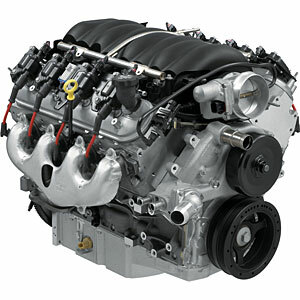 We buy LS3 crate engines with huge discounts as a GM Performance engines dealer. You don’t pay a middleman or high markup prices when you buy our GM crate engines. Our prices are very low and we know that you are paying too much if you are paying a penny over our price someplace else. We sell to mechanics, average drivers, warranty service shops and salvage yards that make our engines for sale in places we could never market them to in the U.S. and Canada. We give you a super low price and sweeten the deal with our 36-month warranty. It could not be any easier for you. You like to build or fix cars and we love selling engines. Because our engines are brand new crates, they can be dropped into your dream machine or car project without alterations required. We have heard some bad stories from our customers that shopped elsewhere online and what they were told on the phone and what they received in person was completely different. You won’t have that problem here. Our staff of engine specialists matches you up with the perfect LS3 engine for your car. The engine is shipped within 24 hours of placing your order and it arrives ready for installation. No problems. No worries. Complete our quote form to get your low price. You can also call (336) 355-5679 and get our low price by phone. You deserve to have great LS3 crate engines and we are the company that will sell them to you and warranty your purchase. Get ready to be amazed by our low prices.